Google today announced it has added hashtag support to Google Search, but only for Google+ content. The update is rolling out “within the next few hours” to English language users on google.com and google.ca. The new feature is part of a broader push to tie Google Search and Google+ closer together. Ever since the social network’s debut, the company has been trying to integrate Google+ into every one of its products and services, and its biggest one is no excepton. When you search on Google for a hashtag, say [#AmericasCup] or [#WaterfallWednesday], a set of relevant Google+ posts may appear to the right of regular results. You’ll only be able to see posts that have been shared publicly or shared with you. If you click on any of these posts you’ll go to Google+, where you’ll see the full set of relevant posts. You’ll also see links to search for these hashtags on other social sites. 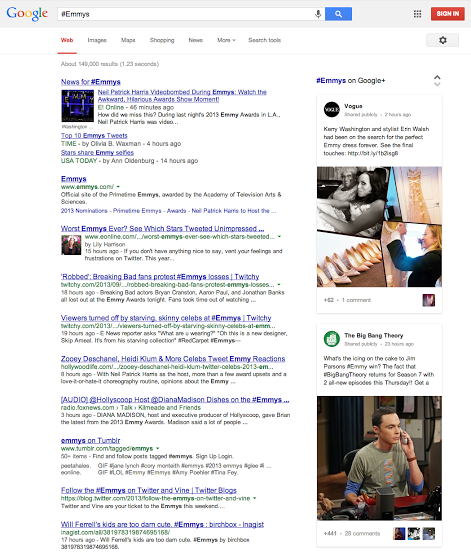 Back in May, Google added related hashtags to the Google+ stream, which it explains is equivalent to “turning any post into an opportunity to go deeper and explore what’s interesting to you.” Given that Google+ is still barely used, especially when compared to Google Search, it makes sense that the next step is to bring the former’s hashtags to the latter. Google users are certainly searching for hashtags already. Whether they will be interested in clicking on Google+ results, however, is a different matter entirely.